The price hasn’t been revealed yet, but given the product is targeted towards datacenter and enterprise use cases, pricing will undoubtedly reflect that. For comparison, 14TB hard drives run about $500 to $600, which is about 20% more per GB than a decent value 2TB HDD. Performance hasn’t been determined yet either, but there’s a strong possibility it will be 10-15% faster than current high capacity hard drives. WD's 16TB drives will be the first to utilize the new microwave assisted magnetic recording (MAMR) technology. MAMR lets manufacturers increase the density of information stored on the disk, which improves capacity and speed. 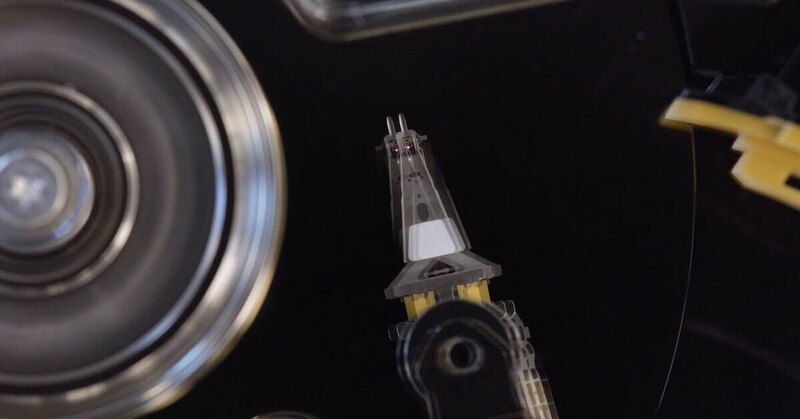 Hard drives record information on tiny metal hairs that can be flipped magnetically by the read/write head to represent a 1 or 0. To increase density of storage manufacturers have shrunk the size of those hairs, but as they get smaller, they require more energy to be flipped. Once the head starts outputting more energy, however, the hairs become harder to control and more errors occur. This Western Digital roadmap suggests that two actuators (the arms the read/write head is attached to) could be used in a single hard drive, potentially creating a RAID 0 situation within one drive. See top image for an artistic rendering. MAMR solves this problem by integrating a Spin Torque Oscillator into the read/write head that outputs a magnetic field which gives the hairs more energy. Because they’ve got more energy, a separate magnetic field outputted by the read/write component of the head can influence them more easily. 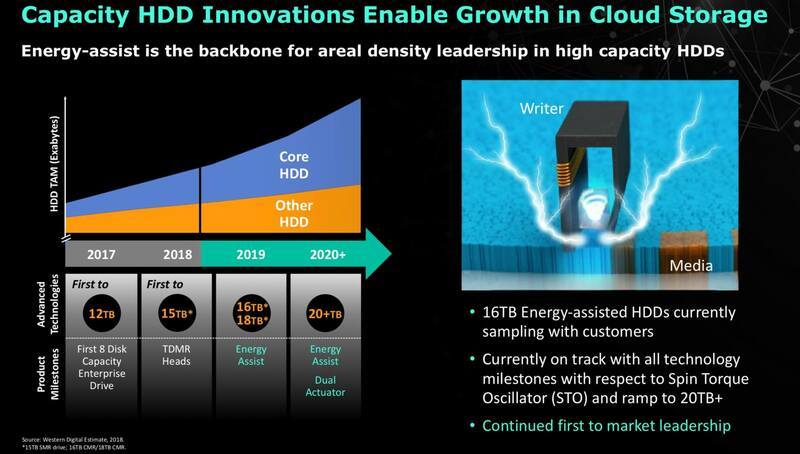 However, Western Digital has revealed that they’re also conducting research into a competing solution called heat assisted magnetic recording (HAMR). HAMR is what Seagate is using for its recently announced 16TB hard drive. It operates on all the same principles as MAMR, but instead of using an electric field to energize the hairs, it uses a tiny laser that heats up the platter to 400C to 700C degrees. It’s surprising to hear Western Digital is investigating this route, considering they’ve previously declared the laser made it too expensive, and the constant heat too unreliable. I'd say you're better off using your capital to make bigger and better SSD. Yeah they need to stop with R&D for mechanical drives. I wouldn't call a technology that was known about since 2006(maxpc had an article on it then with a white paper and why it was a big deal before they bought it) as a next gen technology, just because they bought and buried the patents till SSDs started taking chunks of their revenue stream and started doing research to incorp the tech into their ecosystem to find relavance in a market that is leaving them behind. I'd love for SSDs to be cheaper then HDDs but we are still years away unfortunately. SSDs need to be made 3.7 times cheaper then they currently are to compete with HDDs price wise and I'd wager they will start phasing out HDDs when SSDs are at 1.4 times the cost of HDDs at the same capacity. While mechanical drives will eventually disappear, the SSD's simply have not jumped forward in size, stability, and reasonable pricing. No doubt they eventually will, but it appears that we are more than a few years away from that. Hopefully the demand for larger capacity SSD's for laptops will drive this forward, but seeing them as large as 16 TB could be far into the future and for some, having the capability to configure RAID and similar data protecting measures will be important to the market place. The price of HDD has gone up because people are buying SSD. HDD days are numbered. Any R&D spent on HDD is a waste at this point. Because that R&D will not be around long to monetize on. I for one am very close to saying never again to HDD. HDD's aren't going anywhere fast, as they are a lot cheaper than SSD's. Saying that they're wasting money making them more efficient is ignorance at it's finest. And don't get me wrong, I'd rather have a large capacity SSD, but I'm not wasting my money on it. If anything, hybrids are good enough for me until SSD prices are more comparable to HDD's. Yep well if you need the storage, sure. If your usage is up to 2TB, I wouldn't risk a spinny disk anymore. The performance is trash and the reliability is way below SSDs. For peace of mind I'd pay the extra. The 2TB personally I'd pay for - many nowadays who can and will justify that cost. Just buy like a Sammy EVO and be done with it. There is only one reason why HDD has not already been killed off. They are sucking us dry with SSD prices. It is their wallet padding that has not killed off HDD. The main question is long-term storage and backups. Something that HDDs are supposedly better at than SSDs. HDDs were suppose to supplant tape drives, yet tape drives are still around. What say you? I've heard of SCSI hard drives, but until now, I've never heard of fuzzy hard drives. When did hard drive manufacturers start writing data to "tiny metal hairs that can be flipped magnetically by the read/write head to represent a 1 or 0"? I switched to SSDs years ago, so maybe this is a new thing that happened recently. I try to keep up on tech, but this one appears to have slipped past me unnoticed. So.... how do these tiny metal hairs stay in place at thousands of RPMs? High tech tiny metal hair spray? No, that's not it. Oh yeah.... magnets. Cool. SSD has no moving parts while HDD does. It absolutely must be easier to manufacture SSD than HDD. It's just that the HDD establishments don't want SSD to kill them off yet. If they retooled for SSD, we'd get more SSD for less $$$. I thought all "HDD establishments" have "retooled" for SSD and we are getting SSDs for less $$$. But if by less $$$ you mean SSDs cheaper than HDDs, and it was cheaper to manufacture an SSD than it is an HDD, the margins between the two probably wouldn't be as big as they are now, would they? I'm sure the company knows where and how much of that capital is best used. Yeah, data centers will keep HDD's around for a long time. And SSD's aren't ideal for storing long term right now (think cold storage, which is why people saying HDD's should be phased out already is laughable). The main factor for cost in an SSD is the cost of the NAND. This factor alone is enough to keep SSD prices above HDDs. It's not like WD or Seagate can control Samsung. If it were possible to make SSDs super cheap, Samsung would be doing it right now. It's just not financially possible. Current NAND isn't cheap enough and R&D into new tech is expensive. We are still quite a bit away from having SSDs take over the storage market. The storage space is nice but I am more concerned about durability. That's the big problem with the newer SSDs trying to cram too many bits into a cell. Even if they do reach price parity with HDDs, the endurance isn't looking great. Even right now QLC have pretty poor endurance numbers. Your picture is a Seagate dual-actuator graphic, which of course has nothing to do with WD's MAMR. It does, however, illustrate how Seagate provides about 2X IOPS and sequential throughput over an old-school single actuator HDDs. The combination of multi actuator and energy assisted magnetic recording techniques will keep HDDs firmly positioned in the datacenter for many years. And the irony here for me is I don't trust mechanical drives as much as I do SSD. Maybe I've had a lucky streak, but the dozen SSD I bought are all still going strong. I'm a bit new to how storage works, I know SSDs are faster than HDDs and thats it. Do HDDs and SSDs store stuff forever or do they stop working after a certain amount of time? They both suffer from degradation over time, so neither one is forever. About how long does each live for (average lifespan of HDD and SSD)? I'm not sure an average can be placed on them. There are so many conditions that effect the outcome. To give you a hint as to how long an SSD will store data, lookup data retention. The following link will give you a clue of the differences within Samsung models. Right side bob likes this.